Read the paper, watch the news, open your news app on your phone, how much of what you see is positive? The advertising that is all around us mostly reminds of what we are not, what we don’t have, and places we have not visited. Have you ever wondered what life would feel like if more of the messaging we see every day taught us to be content, peaceful, & hopeful? That’s where The Higher Attitudes Podcast comes in. This show is dedicated to focusing on positive, hopeful, even grateful ways of thinking. Let’s ditch the lower attitudes and adopt higher attitudes. Let's learn to be happy and peaceful and then teach others to do the same. Join us won’t you? Read read of miracles in the scriptures and we are taught that belief is how God is able to work miracles in our lives. But what if we are not sure if we believe enough to have miracles worked on our behalf? The good news is that we don't earn miracles. Instead we ask God for what we need and we humble ourselves before Him and ask Him for relief, trusting in His compassion. Success isn't always what you think it is. What if we learned to broaden our view of what counts as success? What if we didn't have to feel like we were cheating to do it? Interested? This is the show for you. Listen as Julie shares her experiences of learning to redefine success. Is it hard for you to feel spiritual sometimes? Does it feel like it shouldn't be this hard? If so, join Tom for this episode where he likens his spirituality to the childhood game of tetherball. Our spirituality and tetherball seem to have a lot in common! There are days that seem gloomy, inside of ourselves, rather than outside. Sometimes its really hard to shake the blahs. Even positive things like prayer and scripture study don't always seem to help. But there is something that is sure to be a gloom buster. That's what this episode is all about, learning how to bust the gloom our of our lives. Matt wears a banana suit to high school, unafraid of what others may think. He does it to prove to himself that he can be who he wants to be. He is confident and growing in leadership and influence. how does he do it? 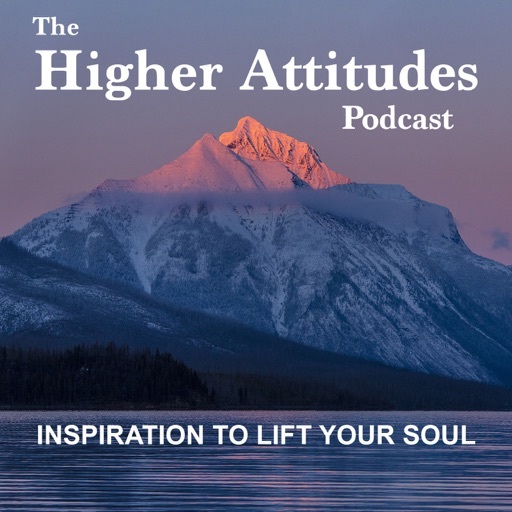 listen to this episode of the Higher Attitudes Podcast and find out. Rank #6: The Perfect Mother's Day Gift: It's Not Too Late! What do women really want on Mother's Day. While many common gifts are very much appreciated, women seem to want three important (and free) things and they want them more often than just on the day that those in the United States call Mother's Day. Prayer journaling can be a powerful way to help us listen more as we pray and to help us more clearly express out deepest desires. Join Tom in this episode as he shares a personal experience he had with prayer journal, a time when he felt God speak to him. It is easy to be critical of ourselves and our efforts to live the gospel of Jesus Christ. We might be tempted to think that our conscience is the source of these negative thoughts about ourselves and our efforts. Don't be fooled. There is another who, day and night, accuses us with a pointing finger of shame to hide our faces. Yes, we need to beware of this accuser for he is our enemy. What happens when physical, emotional, and spiritual health crises converge and you are left feeling our of control. Join Julie for this episode where she shares a very personal story of faith and healing. Many great people do not recognize their own greatness and thus they are kept from doing God's work with the power they might otherwise do it. To get past the habit of self-criticism, we must start with love. Love can make us perfect--enough--for now! Everyone likes busy airports. Right? Well, Tom isn't crazy about them either. But recently, a crowded airport was no match for his new found, seemingly natural happiness. In this episode, Tom invites listeners to become "Disciples of Happiness." Happiness is a discipline worth pursuing. Won't you join Tom on the path? Illness, physical, emotional, mental, comes to us all in one way or another throughout our lives. When we are sick, we naturally seek healing. If we believe in God and have faith to seek healing at His hands, we are encouraged to do so. But what if healing doesn't come quickly or at all. What does this mean? This episode explores how to seek meaning and understanding while we seek healing. There are many spiritual benefits to fasting and prayer. However, many people miss out on these blessings because they struggle with fasting because of medical or personal issues. The good news is that there is not only one way to fast. God will work with us to help us find a way to access the blessings and even joy of fasting. Perhaps one of the purposes of challenges and trials in our lives is to allow us opportunities to develop gratitude and to practice gratitude. But when we are hurting and feeling alone, gratitude is not easy to see or practice. Easy or not, God intends for us to move through our greatest difficulties and arrive at gratitude. He will help us on our journey, no matter to the distance or the steepness of the road. Years ago someone suggested to Tom that he use a journal to record inspiration that came when he prayed. He tried this and found it hard to stay focused longer enough to do this regularly. Years later someone suggested writing a letter to God and then allowing God to "write" back. Intrigued by this idea, Tom set off on what has become a spiritual adventure that has changed his life. © 2019 OwlTail All rights reserved. OwlTail only owns the podcast episode rankings. Copyright of underlying podcast content is owned by the publisher, not OwlTail. Audio is streamed directly from Tom & Julie Obenchain servers. Downloads goes directly to publisher.